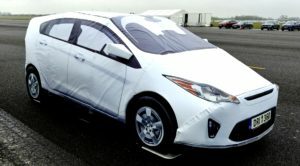 The European New Car Assessment Program (Euro NCAP) held a Global Vehicle Target (GVT) Familiarization event on April 12-13, 2018 in Upper Heyford, UK, to introduce the automotive industry to the an updated version of DRI’s Soft Car 360, which has been selected as the official Euro NCAP car target for the upcoming 2018 and 2019 test seasons. At the event, vehicle manufacturers, tier 1 suppliers, and others had the opportunity to see the GVT firsthand and make their own radar and other sensor measurements of it. For more information about the GVT, or to order go to the DRI ATS website and request a quote for the Hatchback (GVT) model.